Carlos Gonzalez, a 2015 graduate of SAE Institute Miami’s Audio Technology Program, released ‘Dear Neighbor,’ an EP under his performing name, Flapo. I am very proud I had the opportunity to learn from internationally known talents like Charles Dye, Frank ’El Medico’ Rodriguez, Frank Socorro, and Dave Poler. It was an amazing experience. Carlos Gonzalez, a 2015 graduate of SAE Institute Miami’s Audio Technology Program, released ‘Dear Neighbor,’ an EP under his performing name Flapo, featuring Jenni Potts. Originally from Bogota, Colombia and now residing in Miami, Flapo is the name to watch in post-summer 2015 electronic music. His music is described by EDM Sauce, a top website for EDM news and reviews, as ‘Odesza-like,’ an infusion of clean, melancholy vibrance - simple music. Flapo’s passion for music started at an early age. He grew up playing guitar and bass, and credits his discovery of hip-hop as the inspiration for making beats – giving him ideas and creativity to craft the type of music he enjoys making today. It is no surprise that some of his influences are hip-hop artists such as Tupac, Notorious B.I.G, Eminem, N.W.A, Dre, Wu Tang Clan, Ice Cube, Scarface, and Nas. “It all started when my parents gave me an electric guitar as a birthday present…I then discovered hip-hop, which literally changed my life and it’s the reason why I do what I do. Hip-hop gave me the inspiration, the ideas and the creativity to make the music I make today." “When I discovered hip-hop, I became really curious about the concept of ‘beat making’. I spent a long time making electro and progressive house music, but I guess I wasn’t completely comfortable because it wasn’t a natural fit for me,” he said. Flapo’s enthusiasm for dance music, the art of mixing, producing, remixing inspired him to pursue an education in audio engineering and production at SAE Institute Miami, a school he describes as one of the best in the world for audio production training. “The Audio Technology Program is perfect for people like me, looking for a depth of knowledge, but who want to learn fast and get straight to the point. 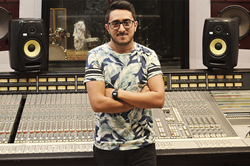 The amount of things you learn is amazing, you can easily dedicate yourself to any area in the music industry; from producing and mixing to live sound, film scoring and post-production,” says Flapo. Flapo is a multi-talented artist. In addition to making music, he DJs and is working on creating a new live show, which will incorporate live instruments, synths and programmed sounds. SAE Institute provides aspiring creative media professionals with a foundation of practical theory and valuable hands-on training in their chosen areas of concentration. Under the guidance of our faculty, which is comprised of working industry professionals, students gain the essential experience they need for entry-level jobs in the entertainment business. Our students are supported in their job searches by SAE’s international network of alumni, many of whom are leaders in the music, film, game arts, and live performance arenas. We offer programs in audio technology across our seven US campuses, along with a music business program at select locations, all fully accredited and focused on preparing students for employment when they graduate. Bachelor’s Degree programs in Animation, Audio, Film, Game Art & Graphic Design are available at the two locations of Ex’pression College, which is owned and operated by SAE Institute Group, Inc. SAE Institute Group, Inc. is a part of Navitas LTD. Learn more at USA.sae.edu. Navitas is a global education leader, providing pre-university and university programs, English language courses, migrant education and settlement services, creative media education, student recruitment, professional development, and corporate training services to more than 80,000 students across a network of over 120 colleges and campuses in 31 countries. Learn more at Navitas.com.